Analysis and Control System Techniques for Electric Power Systems, Part 1 is the first volume of a four volume sequence in this series devoted to the significant theme of ""Analysis and Control Techniques for Electric Power Systems."" The broad topics involved include transmission line and transformer modeling. 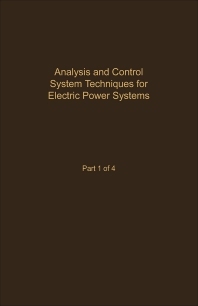 Since the issues in these two fields are rather well in hand, although advances continue to be made, this four volume sequence will focus on advances in areas including power flow analysis, economic operation of power systems, generator modeling, power system stability, voltage and power control techniques, and system protection, among others. This book comprises seven chapters, with the first focusing on modern approaches to modeling and control of electric power systems. Succeeding chapters then discuss dynamic state estimation techniques for large-scale electric power systems; optimal power how algorithms; sparsity in large-scale network computation; techniques for decentralized control for interconnected systems; knowledge based systems for power system security assessment; and neural networks and their application to power engineering. This book will be of interest to practitioners in the fields of electrical and computer engineering.